Outperforms an Upright or Shop Vacuum 10:1! 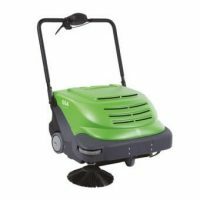 Sweep over 30,000 Square Feet per Hour! Self leveling brushes automatically adjust as you walk across any type of floor – go from VCT, ceramic, carpet, concrete, etc. and the Self Leveling System (SLS) automatically adjusts. The SLS feature also adds years of serviceable life to both the front and side brushes. Ergonomic, Compact Shape for Extreme Durability. Model No. 464E. 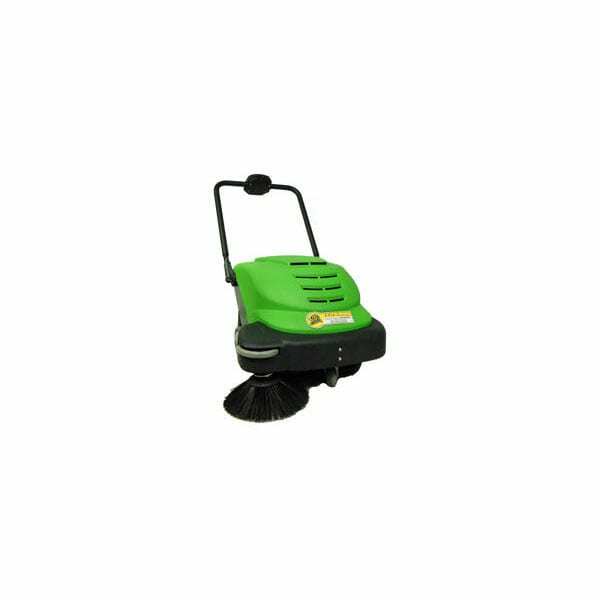 Specifications: 24″ Vacuuming Width, 16″ Brush Width. Productivity (walking speed): Over 31,000 ft² per hour. 9 gallon hopper. 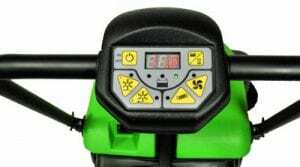 12 volt, 45 amp hour battery. Filter Surface Area: 10 ft². Weight w/ battery installed: 91 lbs. The 24″ SmartVac is in a class all by itself as it changes the speed and efficiency as to how you sweep (and vacuum) floors. 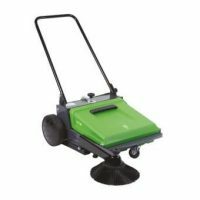 Sweep across carpet (thin exterior types to deep shag), outdoor sports turfs, any hard surface, matted and rubber tiles – Without Making Any Adjustments – Just continue to sweep. Regardless of the type of debris – Small leaves, paper, sticks, rocks, dry mud, wood chips, powders, popcorn, etc. 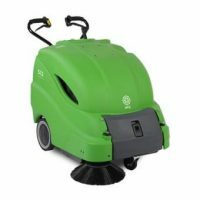 – Debris of all types are efficiently agitated by the sweeper’s brushes and are quickly directly into the hopper by the powerful suction of vacuum – as you continue to Sweep as fast as you can walk. The Smart Technology Automatically & Immediately Adjusts to the Floor Surface and Well as the Size and Type of Debris. Jobs that once took hours now takes minutes . . . Sweep over 30,000 square feet of floor per hour — Drastically cutting labor time. An Upright Sweeper sweeps at less than 3,000 ft² / hour and a Wet/Dry Vacuum at less than 1,500 ft² / hour. How Effective & Efficient is a Smart Vac? The large diameter brushes create a higher volume of airflow as they safely “flick” the surface to release solids and ultra fine dust particles. 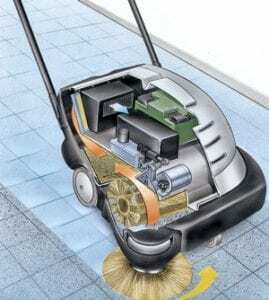 With the higher volume of airflow, surface agitation, and the internal high CFM of the vacuum’s suction, deep embedded soils and fine powders are released from the surface and deep from within carpet fibers . . .
— Even AFTER Carpets have been Swept with an Upright Vacuum Cleaner! Are you vacuuming dry powders and you feel like you need more down pressure, to possibly vacuum the finest of powders that may be lodged deep inside a carpet’s fibers . . . Simply increase the brush’s down pressure.